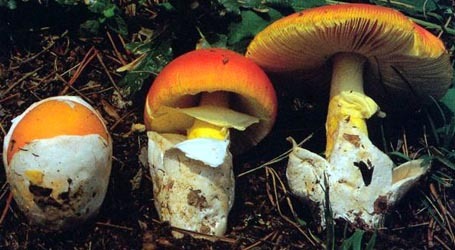 english name "Petersen's Ringless Amanita"
1. Amanita sp-GSM02, GSMNP, ca. Gatlinburg, Sevier Co., Tennessee, U.S.A.
intro For the time being, please refer to the technical tab of this page. The following material is based on originall research of R. E. Tulloss. pileus Honey yellow with Saccardo's umber disc, umbonate; context white, very thin, narrowing evenly for ca. 0.5 radius, then membranous to margin; margin striate (0.3 - 0.4R), nonappendiculate; universal veil absent. lamellae free, crowded, white to Ivory Yellow in side view, rather narrow; lamellulae ??. 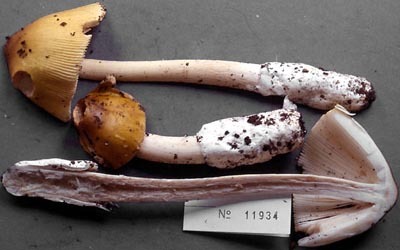 stipe white to Cream Buff, narrowing upward; context white, hollow or stuffed with loose cottony white fibrils; exannulate; universal veil saccate, enclosing one-quarter to one-half of stipe, membranous, white, persistent. [40/1/1] (8.5-) 8.8 - 11.0 (-13.5) × (7.5-) 7.6 - 9.0 (-10.3) μm, (L = 9.8 μm; W = 8.4 μm; Q = (1.05-) 1.10 - 1.32 (-1.50); Q = 1.18), hyaline, colorless, thin-walled, smooth, inamyloid, subglobose to broadly ellipsoid, infrequently ellipsoid, sometimes deformed (then peanut-shaped or pyriform or elongate-pyriform or constricted pyriform), adaxially flattened; apiculus sublateral, cylindric, proportionately large; contents dominantly monoguttulate with additional small granules, occasionally multiguttulate; white in deposit. material examined U.S.A.: TENNESSEE—Blount Co. - GSMNP, Schoolhouse Gap trailhead [35°37'38.79" N/ 83°43'35.83" W], 18.vi.2004 Dr. Ronald H. Petersen TFB 11934 (TENN ? ?, nrITS seq'd.). Sevier Co. - ca. Gatlinburg, GSMNP, Grotto Falls trailhead [35.6752° N/83.4858° W, 780 m], 12.vii.2004 Juan Luis Mata s.n. [Tulloss 7-12-04-S] (RET 375-2). 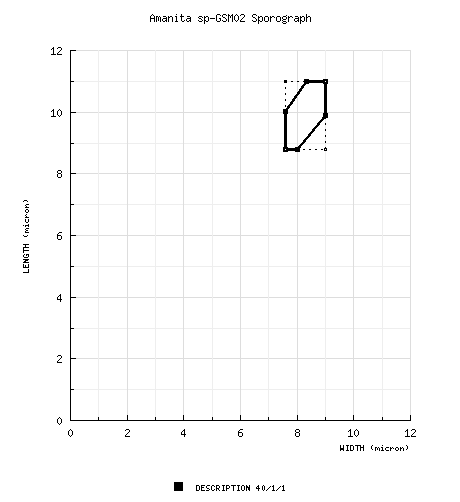 discussion Note: compare with sp-N44. Cloning may be required for nrITS? nrLSU? photo (1) ca. Gatlinburg, Sevier County, Tennessee, U.S.A. Photo used with permission of Hughes Lab, University of Tennessee, Knoxville, Great Smoky Mountains National Park Fungal ATBI project. select a collection to review/add spore measurements..#705947. Dr. Ronald H. Petersen, #TFB 11934, U.S.A., TENNESSEE, Blount Co., Grea..#705948. Juan Luis Mata, #s.n.=>Tulloss 7-12-04-S, U.S.A., TENNESSEE, Sevier Co...#707315. Dr. Ronald H. Petersen, #TFB 11934, U.S.A., TENNESSEE, Blount Co., Grea..#707316. Juan Luis Mata, #s.n.=>Tulloss 7-12-04-S, U.S.A., TENNESSEE, Sevier Co...#778596. Dr. Ronald H. Petersen TFB 11934 , #s.n., U.S.A., TENNESSEE, Blount ..#778597. Juan Luis Mata, #s.n.=>Tulloss 7-12-04-S, U.S.A., TENNESSEE, Sevier Co..#786282. Dr. Ronald H. Petersen TFB 11934 , #s.n., U.S.A., TENNESSEE, Blount ..#786283. Juan Luis Mata, #s.n.=>Tulloss 7-12-04-S, U.S.A., TENNESSEE, Sevier Co..